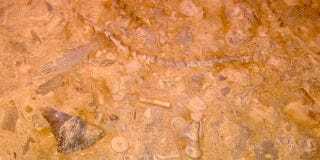 What Creatures Can You Identify In This Fossilized Sea Floor? A fossilized piece of the sea floor is a glimpse into an ecosystem long-gone, if only you know how to look at it. Read on to learn about the long-dead bryozoans, crinoids, brachiopods, gastropods, and even trilobites in this rock.